Hello! Happy Saturday! I hope that you all had a good Thanksgiving and a successful Black Friday. I actually did not go out Black Friday shopping this year- sleeping in in a cozy bed was just too tempting! However, I worked for the first time at Justice from 3-10 PM and it was crazy. Short Pump Mall was insanely busy and I had a hard time even finding a parking spot. All throughout the afternoon and evening, Justice was packed. It was a bit of a wild first night but I enjoyed it. 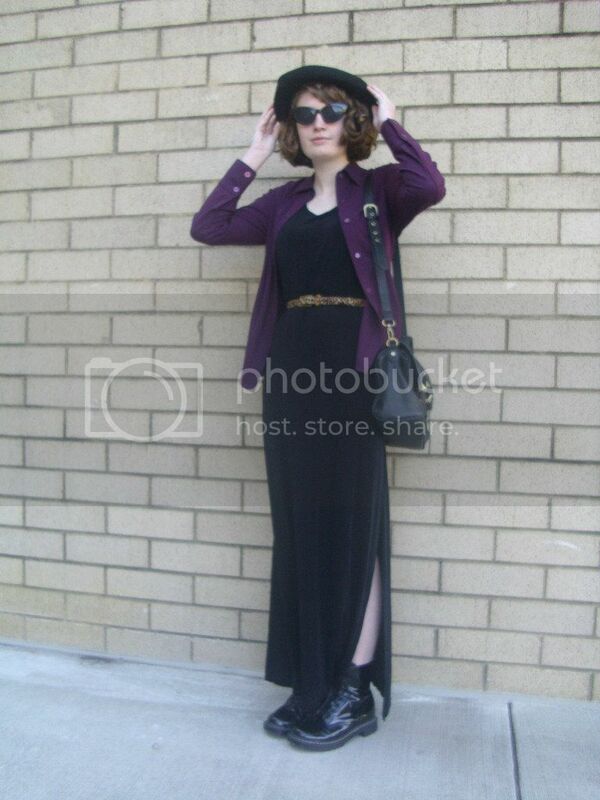 Anyway, I styled today's outfit around this luxurious black maxi dress. Let me just say that this maxi dress is probably one of my best thrift-shop finds ever. A mere 50 cents was paid for this beauty. In addition to being super inexpensive, the dress is also very good quality and versatile. I can wear it down or I can even tie it up in a knot for a funky, asymmetrical look. Pretty soon I think that I will be testing out an ombre DIY on this dress. I added a dose of maroon and a pinch of leopard print to make the look mine. Retro cat-eye sunglasses, a simple hat and combat boots completed the look.